Ever wanted to make your own salsa right out of the garden? Fresh homegrown salsa is amazing and homemade salsa from your late summer harvest is perfect for canning to bring fresh summer flavor to your table all winter long. Best of all, making homemade salsa isn’t hard at all. It is simple and easy to do. 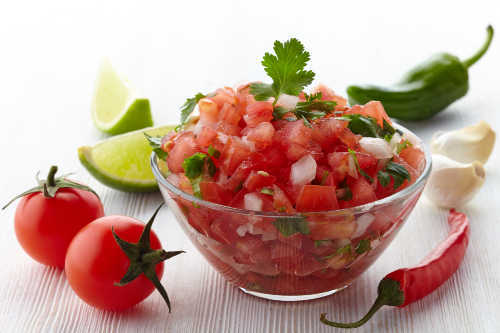 Salsa makes a great addition to Mexican dishes and can be used as an appetizer with nearly any meal. Bring your own fresh homemade salsa to the next party to share the fun. Plant a salsa garden this year and enjoy the amazing flavors you can’t get anywhere else. If you prefer (or you can do as well) can your own salsa for the long winter ahead. Growing your own salsa garden gives you a variety of options for a fresh unique flavor. Have fun and try something new when planting your salsa garden. If you are nervous about trying new flavors you can make sure to plant some of the classic plants as well to make sure you have options when it comes time to harvest. The most important ingredient in your own homemade salsa is tomatoes! 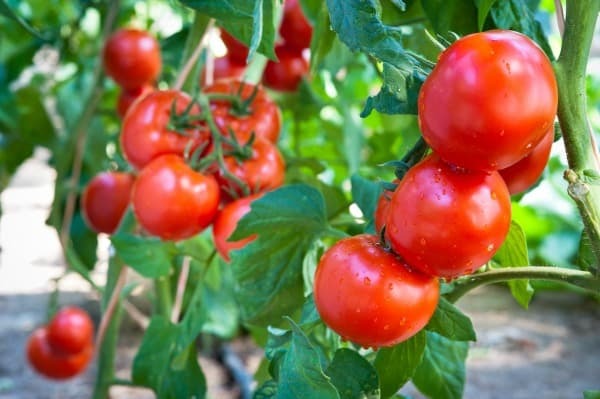 Growing fresh tomatoes in your garden is extremely easy. All you need is a sunny spot, a tomato cage, some great fertilizer and plenty of water. Grow classic Roma tomatoes for a classic salsa or try adding some fun varieties of tomatoes to your garden if you have the room. A sweet chocolate variety would be lots of fun, although there are many different colors and varieties of tomatoes. The options may seem endless! While tomatoes are the base of salsa the onions are a key player. Growing onions in your garden is easy. 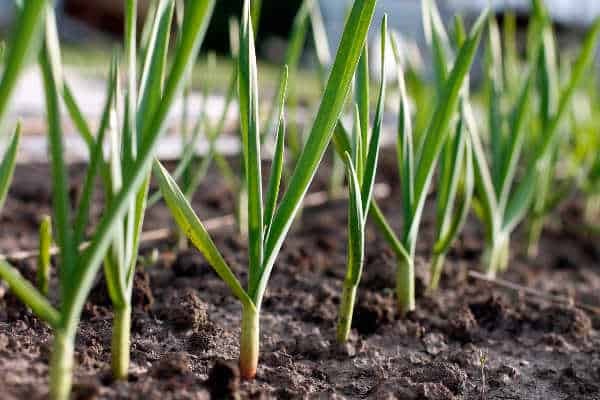 You can start them in early spring after the soil thaws enough to work and the night temperatures stay above 20 degrees. In the late summer to early fall the greenery will die out and fall over. After this happens, unbury the onions and let them dry before harvesting. Onions can take a long time to grow which is hard for the eager gardener wanting a batch of fresh salsa. If you just can’t wait – planting green onions is a great way to get a fresh onion flavor in your early batches of salsa. Onion and garlic chives are packed with flavor and perfect for adding an extra splash of green and plenty of onion and garlic flavor to your salsa. If you want to make salsa before your garlic is ready to harvest, using garlic chives is a great alternative for early season salsa right from your salsa garden. Garlic is a great addition to any garden but an essential in your salsa garden. 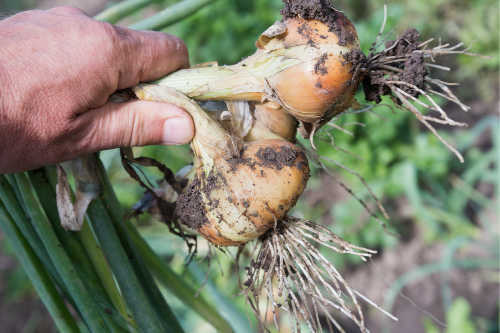 You can plant garlic in the fall or early in the spring when you plant your onions. Garlic is ready to harvest in late July to early August when the greens start to brown. Like onions, allow the garlic to dry for a few days then layout in a cool dry area to dry for 1 to 2 weeks. If you wanna add a bit of kick to your flavor try adding a little red onion. Peppers add a kick of spice to your salsa. 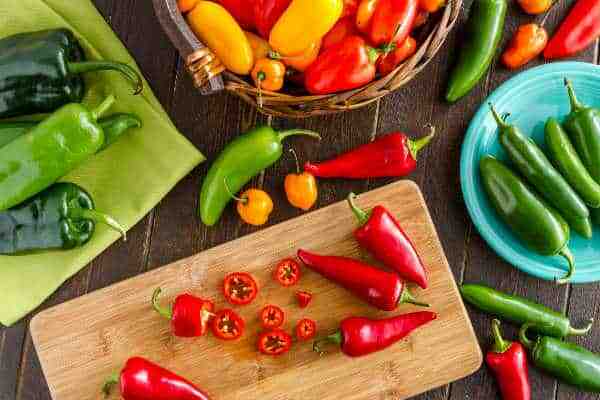 In your home salsa garden, you can grow a large variety of unique peppers. These fun varieties are a great way to experiment and add flavor to your homemade salsa. Give unique varieties of peppers a try if you have space. If your space is limited you can’t go wrong with chili peppers or jalapenos for making a flavorful salsa. I do love to use jalapenos and serrano peppers in my homemade salsas. If you are really like hot salsa you can try using habaneros or a ghost pepper. You will want to use these peppers sparingly. 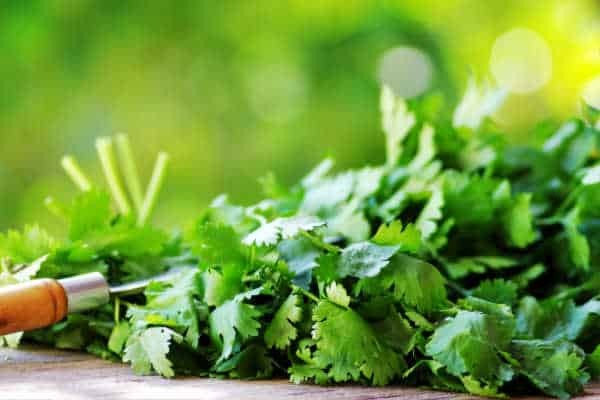 Grow your own cilantro for a tasty garden-fresh salsa. Cilantro is a classic flavor for salsa and while I love cilantro, not everyone feels the same. Luckily, if you don’t like cilantro, you can grow parsley in your salsa garden instead. This will leave you with a similar flavor without the soapy taste some people find cilantro to have.